How do you make use of emerging digital trends? Now cloud software has become an everyday normality for many businesses, digital trends are growing to develop clouds for businesses with different needs. Connected clouds harness the best features of the private, public and hybrid cloud by creating a joint network between the three. In addition to this, connected clouds experiment with new data transfers on the edge of the network, paving the way for faster reply times and customer interactions. Digital trends like developing connected clouds show the growing reliance businesses have on flexible software tailored to their needs; as well as flexibility, versatility, and security, connected clouds ensures your customers and potential clients are always well within reach. 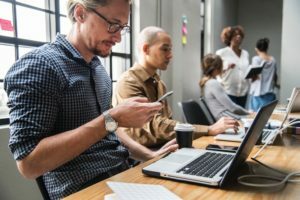 As well as this, digital trends like BYOD have begun to accommodate more flexible working too, making sure that your team always feel comfortable reaching customers with their preferred device. You can find out more about optimising your working environment with BYOD here. Did you know approximately 40,000 searches are processed every second? As technology develops, more and more digital trends are becoming centred around Artificial Intelligence, or AI. Think about the amount of data you process every day – are you using all that information to the best advantage? Digital trends like AI work on harnessing a much bigger proportion of the data we process each day; rather than letting that valuable customer information go to waste, machine learning helps analyse that data for more productive use in the long run. As well as focusing on keeping you connected, digital trends for 2019 are also making progress towards environmentally friendly, cost effective business practices. Tech digital trends tend to follow the preoccupations of the wider world; as we move towards a more environmentally conscious way of living, ensuring your IT systems have tools in place will not only secure your position on digital trends, it’ll see you far into the future, too. In addition to this, digital trends like this will cater for changes in your workforce; by 2020, 50% of the global workforce will comprise of millennials and Generation Z, meaning that the better tailored your workplace is towards the new workforce, the more of this talented set you will attract. How does IoT fit into your working lifestyle? Whether you’re a startup, sole trader or established company, digital trends like IoT have now been developed to streamline working practices. From making your workplace more environmentally friendly, to making working on your commute more simple, to revolutionising your home life, digital trends like IoT promise to shake up the way we think about every aspect of both work and home. While digital trends like IoT are set to take the business world by storm, this phenomenon isn’t a quick fix solution, however. The biggest fears surrounding the new wave of digital trends like IoT focus around distrust; not only does implementing this kind of software means a change in your infrastructure, it requires changing your team’s mindset too. Despite this overhaul of your infrastructure however, the future-proofing digital trends like IoT can offer your business mean it shouldn’t be ignored. Thinking about adopting new infrastructure, but unsure where to begin? Here at CIS, we keep track of the best, most reliable emerging digital trends, so you don’t have to. Contact us for more information on keeping your business one step ahead of the game.